“In the fairy tales, the poor girl smiles when she becomes a princess. There are two blood-castes: the Reds and their common way of life, who serve the elite Silver, with their Royalty and magical, superhuman powers. Seventeen-year-old pick-pocketer Mare Barrow is a Red, and lives with her family in the Stilts. One day she is given a job in the Silver palace, and quickly discovers that she has powers of her own. To cover up the fact that there is a Red with powers like a Silver, the King and Queen make a deal with her: She is to marry their youngest son, Prince Maven, and pretend that she is a Silver who was simply raised by Reds. And in return, they will bring her brothers home from the ongoing war, where Reds are made to fight for the Silvers. She agrees, and Mare is thrown into a world of royalty, of lies, of Princes, of powerful abilities. As she finds herself getting deeper and deeper into a society that is not her own, she risks everything to join the Scarlet Guard, a rebellion group of Reds wanting to take down the Silvers, for their rights, for justice, for freedom. I loved this book. It was like X-Men meets The Selection (Keira Cass). Why The Selection? you ask. As Mare enters the Palace and her powers come to light, she joins the other girls who are there for the Princes, who are to choose a wife. There is immediately a rival, who is chosen by Prince Maven's older brother Cal, to be his wife. As Mare goes from day to day trying to learn how to be a Silver lady, is painted with pale make-up every day to hide her red-blooded blushing face (Silvers have silver blood), and navigates her way from library lessons to fighting ones, she battles with the fact that her family still don't know what is going on with her, her best friend has joined the Scarlet Guard, and her feelings for Maven's brother Cal, are stronger than she'd like. 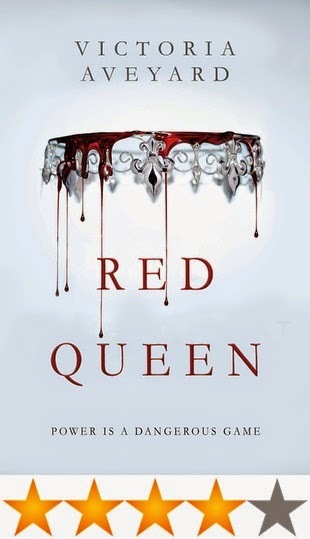 With superpowers like X-Men, typical love triangles, upper and lower castes, an older mentor/librarian with connections to the Royal family, and a main character with Katniss-like rebellion involvement, Red Queen was an awesome read and a great addition to the YA Fantasy/Dystopian world. Why only give it 4 stars then? I think it was probably because I called what would happen at the end (something that, I think, reading other people's reviews, was a huge shock and twist). But it was great, and if you like the dystopian genre, mixed with a little bit of superhuman powers, then do give Red Queen a read. Victoria Aveyard has done a fantastic job at creating this world, especially for her debut novel. Anjali is a New Zealander with a love of DIY, photography, travel, Harry Potter, binge watching TV shows, and blogging over at This Splendid Shambles. Oh and books. She loves books. Her favourite genres are YA, dystopian, and fantasy. Oh I'm even more excited to read this now! I ordered it from Amazon on Tuesday, so hopefully it arrives today :) Sounds very interesting! Let me know what you think when you've read it!